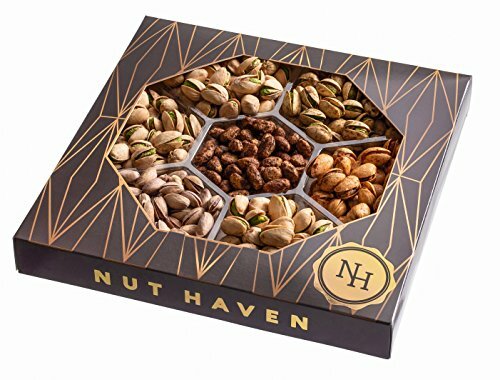 The most discerning customers - prestigious corporations, retail outlets and hospitality venues - choose Nut Haven gift baskets because they know that no corners are cut. Simply, Nut Haven gift baskets look the best and taste the best. Now, you and your loved ones can enjoy them too! A Nut Haven gift basket is just an awesome choice to send best wishes and love to anyone, for any occasion: "I love you"; "Happy Birthday"; "Happy Anniversary"; "Happy Holiday"; "We appreciate your business"; "You have been selected as Employee of the Year"; "Get Well Soon"; "It's a Boy! "; "It's a Girl"; "I'm Sorry"... They all sound better - and taste better! - with Nut Haven. You've always loved cracking open the pistachio and enjoying its smooth texture, delicious sweetish flavor and wealth of antioxidants, vitamins and minerals. Nut Haven's mavens have the pistachio down to a science and innovatively bring out its natural goodness in every way possible - from sweet to spicy, and everything in between. If you would find yourself unable to put away the pistachio bag in the past, you are advised to really stock up on Nut Haven pistachios. You've never tasted anything like them before! Certified kosher by the OK. If you have any questions about this product by Nut Haven, contact us by completing and submitting the form below. If you are looking for a specif part number, please include it with your message.